George Graham Reviews Guaco's "Como Era Y Como Es"
One of the surprises of 1999 on the pop music scene has been the commercial of Latin-influenced artists from Ricky Martin to Santana. While those hit records have shown some Latin influence, the real stuff, from Cuban salsa to South American folk to Brazilian samba, with lyrics in Spanish or Portuguese has yet to sell a lot of records beyond the Latino community. But the Latin-influenced hits have perhaps begun to lay the groundwork for a greater appreciation among wider audiences in this country for the remarkably wide range of interesting and generally danceable music from south of the border. While most of the Latin music getting attention is from Mexico or the Caribbean, this week we have a new recording by a group from Venezuela that can only be described as amazing. 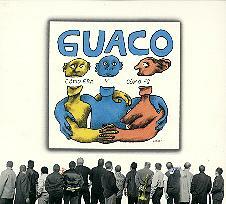 They are called Guaco, and their CD is named Cómo Era y Cómo Es. Guaco has been around since the late 1960s, when they started as a band performing traditional styled Venezuelan garitas, but over the years, they expanded in both musical scope and size, gradually adding instruments and influences, first percussion, then horns. The current lineup has 17 members. They have released 27 albums in Venezuela, and have been the best-selling band in their home country for the past 10 years. Cómo Era y Cómo Es is their first US release. The translation of the title, by the way, is "How It Was and How It Is." The group's biography speaks of Carlos Santana performing in Caracas about a decade ago and being greatly impressed by Guaco, who were opening for him at that concert. He took to performing one of their songs, and has since returned and collaborated with Guaco. After 30 years together, Guaco has evolved into a remarkably eclectic ensemble with absolutely stellar musicianship and some head-spinning arrangements that borrow from salsa, South American dance beats, some Caribbean music, jazz, fusion, funk, and even some art rock in the tradition of Yes. And their arrangements are apt to turn on a dime, careening from one influence to another, somehow without missing a beat or sounding disjointed. There are three different lead vocalists who take turns. They range from an energetic rock-influenced style to a more traditional romantic Latin approach. The instrumentation is rich on percussion, but maintains a full horn section, with trumpets, trombone and sax, and some additional guest horn players. Especially notable is guitarist Pedro Navarro, who brings a jazz-rock fusion sensibility to his playing. Guaco's musical director, Juan Carlos Salas, by the way, is one of the trumpet players. Most of the original compositions on the CD are by Ricardo Hernández, who does not appear on the album, with most of the band's impressive arrangements by trumpeter Salas. This is obviously a group that performs live a great deal, and probably rehearses even more. The level of musical tightness, and their facility in playing the intricate arrangements is truly impressive, even more so as they make it all so danceable. Though there are no English translations provided in the CD booklet for the Spanish lyrics, most of the songs are about dancing or having a good time, with a couple of love songs. Every so often an album will come along that will raise a musical genre to a whole new level. Guaco's new release Cómo Era y Cómo Es, is one of those records. This 30-year-old, 17-member Venezuelan group, with 27 albums to their name, combines breathtakingly tight musicianship with head-spinning eclecticism and fascinating arrangements that really highlight their pleasure in stylistic hopscotching. Perhaps most impressive is that they do it while remaining uniformly and irresistible danceable. For those who think that the best musicians are in the major music capitals of the world, it's also a reminder of the remarkably well-developed talent based in places like Venezuela. Our sound quality grade for the CD is an A. The recording was made in the Caracas, Venezuela, but mixed in Fort Lauderdale, Florida. The audio is bright and clean, nicely capturing the sound of this big group. There's not a lot of dynamic range, with some audio compression obviously being used, but this is a high-energy album from start to finish, so that is not as important here. Even with Latin American music seeing increasing popularity among general audiences in the US, it's still doubtful that something as interesting, and downright creative as Guaco's new CD will ever find its way to the top of the US charts. But for fans of World Music, traditional salsa, and just those looking for the ultimate party dance record, Cómo Era y Cómo Es is not to be missed.